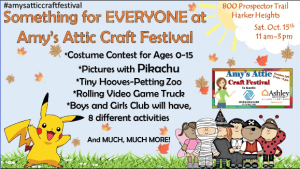 Please join us on October 15th for Amy’s Attic Craft Festival for Boys & Girls Clubs where we are partnering with Ashley Furniture HomeStore Killeen, TX to raise funds for Boys & Girls Clubs of Central Texas. • More than 55 original crafters and sales vendors. • Yummy food options, including FREE frozen custard from Freddy’s Frozen Custard & Steakburger Harker Heights. • FREE trick-or-treating and costume contest with prizes for best costumes in 0-5, 6-10, and 11-15 age ranges. • FREE bounce house and 8 kids’ activities sponsored by Boys & Girls Clubs of Central Texas. • FREE photo opportunity with Pikachu from Party-N-Jump! • Raffle with prizes to include a recliner from Ashley HomeStore, a grill and $50 Visa gift cards from Amy’s Attic Self Storage, plus more prizes to be announced. • Entertainment provided by Illuminate 24 Hour Gym and Royal Elite Divas of Central Texas dance team!